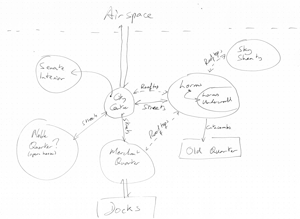 Some history: in late 2012 I had the idea for the City Accelerator, wrote down a few blog posts and then wondered how to turn it into a generic RPG tool. That tool is now getting used after a fashion in Black Mantle, but on its own it’s only really worth a couple of blog posts — which is what I’ve decided to do here. A few months ago I wrote this minigame for exploring the high-level details of the City — putting it in the context of the country and surroundings, deciding on what the barrier(s) between the Outside and Inside look like, etc. 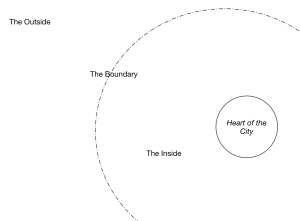 I’m considering the City in the most abstract, setting-agnostic sense — it’s an area defined by Outside and Inside, with an interior set of features and an interior population. And this next part covers the City’s hierarchy — the people and the factions. the Middle Tier is for Bishops and Rooks; these individuals lead bodies of people — corporations, pressure groups, unions, economic and political interests. They are accountable to the Upper Tier. The Pieces are positions, not Citizens. Individuals can transition between the roles in any direction — laterally, upwards or downwards. The normal progression is upwards, tier by tier — so an ambitious Knight in turn becomes a Bishop and ultimately Queen or King. But sudden transitions are just as possible — a Pawn is elevated to the King position, a Queen falls to the position of Knight, and so on. The King is an Upper Tier piece. It represents the overall vision of the City, the ideals and principles on which it operates, and even the connection between the City and higher powers. The King could be an actual person (a regent, a philosopher, a prophet, a god-king) or could be a set of principles (laws or history handed down, a connection with the past or with principles) or some thinking but inhuman force (a vast computer, a captive god, a source of magic). On its own the King is powerless; it’s a figurehead that others look to for direction. It needs the other components beneath it to take any action. If the King is ever deposed (the Regent is replaced by a republic; the Computer is smashed by luddites; the Sacred Scrolls are burned in a revolution) then the whole tone and principle of the City will change to suit the new King. This may be reflected by thematic changes in the Heart of the City. The Queen is an Upper Tier piece representing the authority of, and acting on decisions of the King. It will never be abstract, always a person or group of people (a Prime Minister, a Vizir, a Council acting on certain principles of law, etc.) but it could be obviously separate from the other citizens — an elite priesthood, a cabal of magicians, undying robots or clockwork automata, etc. The Queen has absolute authority and power in the Heart of the City. Outside the Heart they have no direct authority, but instead need the support of their Rooks to impose city-wide order. The Middle Tier Bishops are individuals who lead bodies of people — including unions, political factions, cults and religeons, and corporations. Technically the Bishops are answerable to the King, and are kept in line by (but not accountable to) the Queen. For City design there is typically one Bishop per District — if the Bishops are forced to share then they will tend to be weaker as a result, and if a District has no Bishop then something will move to fill the vacuum. Since the Queen can’t exercise direct power outside the Heart, it needs proxies to carry out its will throughout the City’s districts. This is where the other Middle Tier pieces — the Rooks — come in. Functionally these are similar to Bishops in that they represent bodies of people — in this case police forces, a standing army, or other peacekeeping body. They’re not necessarily so overt, though — they could also be a secret police force, or even enforcers for organised crime. In exchange for enforcing the Queen’s directives on their District each Rook enjoys some privileges (like the power to imprison or impose fines, immunities, etc.). These privileges mean each Rook is functionally on a similar power level to the Bishops, though unlike Bishops the Rooks don’t need to look to conquest or alliances for expanding their power — if they need to defend their position (or attack a Bishop) they can sanction resources from the Heart of the City. Note that resources granted by the Queen are ultimately traceable back to that source — so if your Rooks are a shadowy organisation or deniable asset this could make for an interesting mystery game. Rooks might pose as Bishops, Bishops pose as Rooks, etc. For the purposes of the Lower Tiers there’s not much difference between Rooks and Bishops — both represent employers of some kind, with internal drives and interests (primarily self-preservation, and growth). And indeed, some Bishops become Rooks, and some Rooks become Bishops. The main difference is where their power comes from. Knights are individuals with no political territory; they may have personal holdings and affiliations to others, but they don’t represent any kind of organisation. Like Pawns, they will work for a Rook or a Bishop; unlike Pawns they’re not fixed in place, and instead free to make contracts with whomever they choose. In the most common RPG formats the Player Characters are all Knights — free agents with personal power who make their way on their own, forming short-term alliances with Middle Tier employers. Like Knights, Pawns are individuals. Unlike Knights they are fixed in place, which is both an advantage and disadvantage. They will tend to belong to a particular workforce (headed by a Rook or a Bishop) and will be slow to change their working situation. Pawns are content to be where they are, forming deep links with their community, family and culture. This is the one thing an itinerant Knight doesn’t have; nor does the Bishop or Rook, even if they otherwise represent a community. Pawns are most interesting when you consider what might cause them to transition from their current, comfortable position to another piece. What happened in their life that they suddenly became a Knight, a Bishop or even the King? All of these should be considered a “Kicker” — the Pawn character has been suddenly outlawed, made an offer they couldn’t refuse, or changed direction of their own life because something happened to disrupt their world (a death, a loss of position, an encounter with something or someone magical or mysterious, etc.). what alliances might look like when deposing a King or Queen (who gets to be the new King? ), or conquering a Bishop (how do you divide up the previous territories? Does a District get broken up and its locations absorbed into other Territories? ), etc. There are a few other philosophical points like the benefits of Messy Design and the limits of Working Memory. TL;DR the harder it is for your players to view the City conveniently, the harder it is to get across the scope, scale, culture, or actually interesting details — they all get lost. 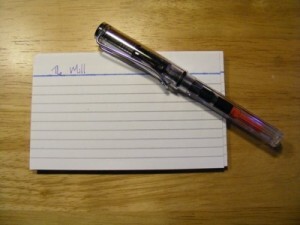 One of the reasons I started this blog was to keep my hand in writing something, anything. 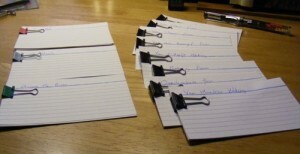 It helps, because for some reason I can have ideas and be really lazy about writing them down. I have bad habits. Anyway, this is my game. It’s called Black Mantle. This is a game about a dystopian City where Citizens are born into “Work Philes” or vocational tribes. That will be their life unless they can ascend the PRIV ladder and become higher-tier citizens. But while the propaganda is that anyone can achieve a higher tier through hard work, the economic realities work against anyone even trying to make it out of zero level. The exception is for Mantle pilots who plug themselves into the Mantle exo-suits and venture outside the City, at the behest of one of the City’s Corporations. No-one knows what exists Outside, and pilots contracted to the Corps are forbidden from talking about their missions within The Interior. But if you have the neural aptitude to sync with a Mantle, the Corps will want you. These are the Player Characters. They are young and inexperienced, and the only thing they know about the Outside is rumour. Mantle pilots are rewarded handsomely with PRIVs. Previous zero-level workers can suddenly find them ascending the citizenship tiers (levels 1 through 10) and mixing with higher level citizens, including the movers and shakers in the Corps and Government. They’ll be instant celebrities. The PRIV system also allows them to take their family with them to the upper tiers; some do, others leave their old Work Phile far behind. What did you see Outside? Why does it Haunt you? What did you take back from Outside? Why do the Corps want it? Where is your family? Do you need them? Where and what is the City? This is a consciously “heterogeneous” i.e. not unified design. It is also “asymmetric”. The Interior system which represents the characters as Citizens is fairly freeform and designed to cover the relationships between the characters. Not sure about this system; maybe borrowing something from Dramasystem. The Exterior system is (at the moment) all OSR, with some tweaks (e.g. some of the Death Comes To Wyverley extra rules to change survival, and add scaling mechanics). Exterior missions should function very much like dungeon adventures including exploration, combat, and mission reward. Rewards specifically are experience points but these are an in-game property; do better in your mission and get PRIVs, rise up the ranks, and get access to better gear. 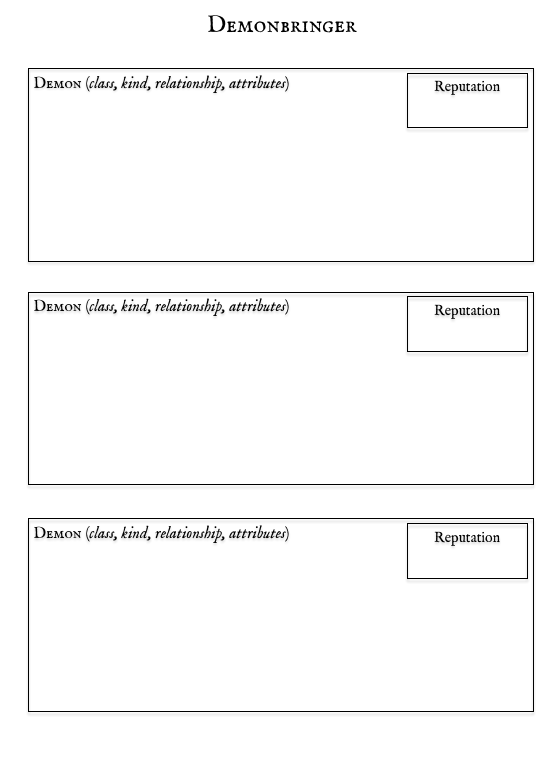 Other OSR-like bits include considering what is “player facing” such as charts and tables; and how to efficiently support the GM in managing factions and their motivations. There is a feedback mechanism between the Exterior missions and the Interior setting, but I don’t feel confident in talking about that just yet. There’s also a collaborative element to starting the city, something that’s evolved since I thought of the “city accelerator” tool. There should be a discussion about what happens when the meta-game Wall breaks down, and the Exterior OSR procedural-style games bleeds into the Interior drama-style game. Mainly influenced by two manga/anime which are surprisingly similar: Attack on Titan, and Knights of Sidonia. Both feature young protagonists with limited knowledge of the space outside the wall. In addition there are internal hierarchies and political struggles within the human community. Oh yeah, and giant robots / three-dimensional movement gear / titans. Most important feature of these two series is their asymmetry. The protagonists work by a different set of rules inside and outside the “City”; this is particularly apparent in Knights of Sidonia where the interior scenes are all about exploring Sidonia and the relationships between Nagate, Izana and Yahuta, and these characters can be strong inside and weak outside, or vice-versa. Mechanically influenced by Flatland Games’ Beyond the Wall. 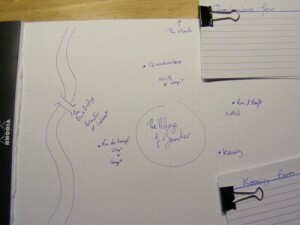 Various discussions of the transition between the interior (village) and exterior (beyond the wall) are elsewhere in my blog. Also influenced by various Sine Nomine OSR games. I have strong views on settings, in that when I buy a game I don’t want to be spoon-fed someone else’s setting or worse, metaplot. One of the strengths of some OSR games is how they provide a framework for creation of the sandbox and the GM’s own setting, so I’m bearing this in mind. Another issue is the Big Secret, which IIRC was a problem with the Engel RPG. It goes like this: there’s a big mystery to do with the world which the players are ignorant of, and which forms the central piece of interest in the GM’s section, and often the whole motivation for the core activity of the PCs. Once you know that, the central interest is lost. This is also a feature of some of the fiction above (notably the millenial YA genre) so while genre appropriate it limits the lifespan of the game. This is a non-trivial problem to solve, and at this stage I don’t have a good answer. But something to be very mindful of. Having enjoyment as player limited by having previously GMed is something to avoid. I’m in the nice position of being in touch with two different con-organising gaming circles, which sometimes means two holidays. This year I hadn’t expected the two holidays to be back-to-back, though. We arrived back from Derbyshire, put some washing on, took a nap and then packed off to the second holiday which was thankfully 20 mins away. The games I write tend to get repeat play these days, but rarely so close as one week between sessions. That meant the successes and failures of the previous sessions were still fresh and I could reshape the bits that didn’t work. Some of these games I can talk about more than others, since the GMs may want to run the games a second time. The Hunt was a simple, strong premise: the PCs woke up in cages in the middle of rural Derbyshire in winter, to the sound of horns and snarling dogs and the sight of elfin creatures lined up on a nearby ridge. System was very light, atmosphere was very heavy. I’m a big fan of the GM’s style–she’s a devotee of fairly obscure computer mystery games. Vikings followed the fortunes of six heroes on a voyage to Constantinople. System was light, but a decent enough framework for a good cinematic fight scene at the end. The GM did a great job of ensuring players never missed a turn during the action. I played Peter Dinklage Erik the Dwarf, and murdered the King of Denmark. Mobile Frame Zero is a wargame by Vincent Baker and Joshua Newman that uses lego. This was the game I was least certain of, mainly because I don’t have an obsession with Lego. The game itself is great, though–it took me back to living-room sessions of Adeptus Titanicus. It doesn’t demand management of large numbers of miniatures (unlike WH40K). I really liked the coloured d6-based system, with its defence and spotting rules. And of course when you blow up enemy mechs and terrain features you get to take them apart and scatter the debris over the table. It is a game about scoring points though–I wonder if it could be adapted to RPG duty and remain balanced. even unbalanced I’d take it over Mekton Zeta. Lots of delicious lego mecha here and here and here (last one is Soren Roberts – I believe he gets a design credit in MFZ). It Takes Two, Baby used the Unbelievably Simple Role Playing system, with two players playing two personalities (light and dark) inside one head. All characters were being treated at a residential facility. A lot of the interaction was between light and dark halves, vying for control of the same body and whispering to one another–we had a Tyler Durden-style pair of twins, a child paired with an imaginary friend/terrifying poltergeist, and a student haunted by her dead grandmother (who described herself as “corporeally disadvantaged”). Players paired up and collaboratively generated their light and dark halves, which was a really great way of getting into character. Vampire: The Welcoming Party was a blast from the past–specifically 1995. We were reminded of the true misery of being a neonate, never being given a straight answer and being continually strung along by elders. With that in mind I felt the game managed to parody the kinds of games we used to play quite nicely, and I enjoyed playing my Nosferatu. Mao Tse Tung Said was a game about university friends who were once revolutionaries and had since sold out. The GM has a great feel for satire and situational comedy-drama–a few years ago he ran The Thick Of It as a game (and coincidentally came very close to a Malcolm Tucker impression in Don’t Waste Your Life). This game used a trait descriptor system with the option to burn resources (flashbacks, current affairs) to get information from the GM. Also-rans that I didn’t get to play included sessions of Monsterhearts, Witch, Dog Eat Dog; Paranoia on a generation ship; various mystery games which sounded great but I don’t have much detail on; and Modern Times, a game whose prep involves many different cards and dwarfs the effort I put into Sunder’s Children. I chose commercial systems for both games, with the intention of sticking to the rules as much as I could. This hasn’t always worked in the past (e.g. Wild Talents was a bad choice). This was my Don’t Rest Your Head offering, about newly Awake characters who had just graduated without the grades to realise their dreams. I gave the players a blind pick of powers lifted from the excellent Don’t Lose Your Mind. 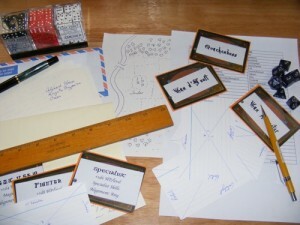 The prep time was one tenth of that for my other game–no silly props, just character sheets and powers in envelopes. Since the system effectively manages resources via dice, the players found it very easy to grasp. Also it uses d6 with spots rather than d10s with numerals – for a hunt-and-peck success game traditional d6 have a huge advantage for Search vs Handling Time. I was expecting the players to collapse into nightmare within the single session. This didn’t happen because as the GM aquires Despair tokens and spends them to cause either Exhaustion or Madness to dominate, the players in turn gain Hope tokens that allow them to remove Exhaustion or Madness checks. This tended to be self-limiting (at least for Exhaustion) and the players hovered around 3 exhaustion dice throughout. Increasing the difficulty forced the players to risk rolling more dice but meant that Pain often dominated, feeding the Despair and Hope economy. The GM is encouraged to spend her Despair tokens regularly to keep the economy going, something I didn’t do enough in the first run. With the Despair economy working the only thing that was likely to push the PCs over the edge would be over-use of Madness talents, or doing something reckless like sleeping. My first group hadn’t fully grasped that sleeping was a bad idea, and so when they volountarily took a nap their characters were hollowed out by nightmares and became adversaries (with new powers). Interestingly I could have killed those characters as they slept, but they were later unable to directly kill the other PCs (even when one enemy player stabbed anther character over and over again). The game doesn’t have hit points; the way nightmares get you is persistent needling until they drive you to exhaustion or you drive yourself to madness. I was rather pleased that in my second group one player aquired a point of permanent madness through excessive use of his power–a power that required creative and excessive swearing that would make Malcolm Tucker blush. Overall I got very positive responses from both groups on the system. At the same time the whole game was markedly different between the groups–I’d designed it as a sandbox using the City Accelerator methods, and the players were free to explore. One side went looking for trouble, the other side ran away all the time. The game also confirmed that games that can run over several days rarely do, because players will rarely take downtime volountarily–especially with a mission-focused game where there’s no resource-replenishing benefit to sleeping. One final comment–it became clear that this was not a game the GM could fudge. In other words, the GM had to always roll to oppose a skill check, on a direct 1-to-1 roll. No asking the whole group to “roll for Perception to see who notices” as an unopposed role – if you do that, there is no chance for Pain to dominate. Also the GM can’t just roll once and ask the players to roll against their single roll. In both cases you diminish the chance for Pain to dominate, making it more likely the PCs will become Exhausted or mad, and stifling the Despair Token economy. Sunder’s Children was also a game about people being left behind–in this case, being part of a village community and watching your friends and family go off to war and adventure, leaving you at home to watch the farm. I wanted to run a Lamentations of the Flame Princess game. 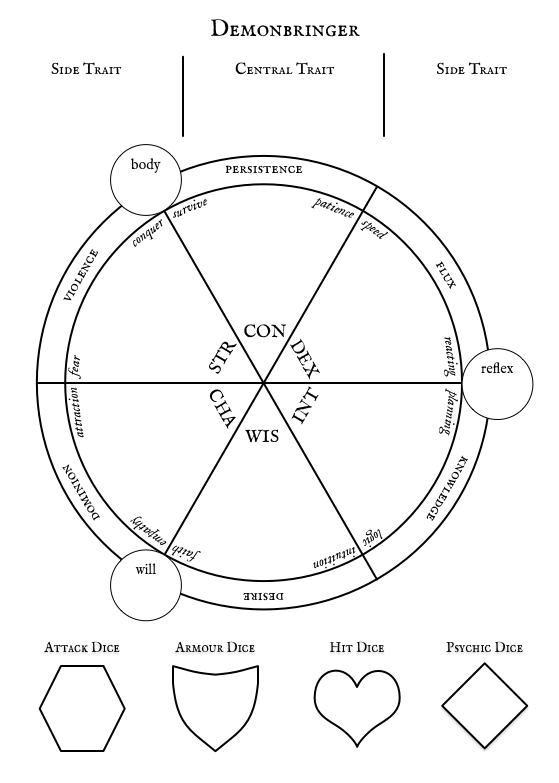 I wanted to use cards to track spells, equipment and so forth (kind of a poor man’s WFRP 3e). The map grew as the PCs explored, with view distances limited by hills (pink) and trees (green) but further over water or plains / settlements. The downside to a big map made of component tiles is that eventually we reached the edge of the table and we’d have to spend 5 minutes relocating tiles. 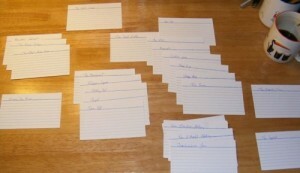 The table was already choked with character sheets, spell and equipment cards and handouts, so the late stages of the game became an exercise in prop management. Random character generation. LotFP uses 3d6 for each stat, rolled in order. No “roll 4 and take the best 3” or point-for-point adjustment of ability scores. Character death. Two characters died, and three others became so horribly maimed as to be unplayable. One death was from a late-stage failed saving throw, and probably felt completely arbitrary (and as a result I didn’t use that trap in the second game–it went slightly too far). Random tables. There were a lot of these, including the Misery and Drudgery tables for farm work, and the Strangeness, Weather, Creature, Corpse and Omen tables in the later stages of the game. 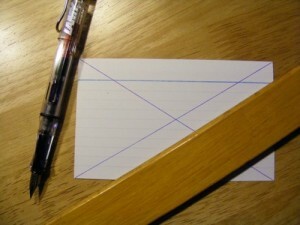 Narrow spell definitions. More than once player tried to use spells to do things that could be inferred from the spell name but were outside their function. That last item is a consequence of the kinds of fantasy games we play these days–very little mechanical crunch and high on description, with magic as a broad field of ability rather than a very narrow and specific effect. As for random character generation, one of my players said it was a useful example of “how far RPGs had come” since the days of random rolls to generate a PC. I think that’s a peculiar statement that belies a particular style of play favoured by that player–they like to play very competent characters where those competencies are mechanically described in the rules and win/lose can therefore be ascribed mechanically and randomly. That attitude is also pretty much outdated in today’s indie gaming culture where PC response to success or failure is more interesting than the pass/fail conditions themselves. I changed the class assignation between the games, as well as the way spells were distributed. I felt the second game was a lot more successful, although there was some confusion regarding spell cards–they all looked the same but spells could come from books, scrolls, or just be available to cast as one-shot bits of magic. That can easily be fixed by changing the card mixes if I run again. Spells were self-aware and could infect humans in the second game. This is how a bunch of 0 to 5th-level humans ended up running around with high level spells. Some of them did more harm than good. In both games I managed to run an ooze and render one or more characters unplayable through the loss of body parts. One of my players cast Contact Outer Sphere, which I really hoped would happen. The Summoning spell is complicated and needs a crib sheet written for it. The Web spell was probably the best mass effect battle spell, with Magic Missile a popular second. Traditional cleric spells (Cure Light Wounds, Turn Undead) didn’t get much use. Players were too busy Webbing monsters and chopping them up. Part of LotFP and D&D in general is the reward mechanism. I had to break the rules here and give the players outrageous XP rewards to allow them to progress levels. On the whole, I like the system a lot for its simplicity and the way it allowed me to run big fights fairly quickly. I don’t think it’s a game either I or the players would take particularly seriously, though, so doesn’t have much repeat play value for us. The encumbrance system is as good as I expected it to be–in fact the whole game is what I expected, i.e. suited for high-bodycount dungeon crawling and not much else. p>DRYH and this particular implementation of LotFP have a couple of things in common. Firstly, they allow the GM to take a very adversarial role. 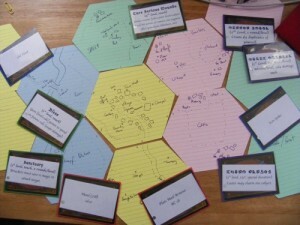 Second, the use of tokens on the table allows a high degree of player self-organisation. Normally buckets of dice systems are attractive to players because of their tactile nature–they feel more in control the larger the dice pool they manipulate. Those dice however only exist in the hand. In DRYH the dice exist on the table as physical markers–Discipline and Exhaustion dice as permanent, and Madness as temporary. Players gain a lot of autonomy by being able to voluntarily pick up dice as a response to a particular threat. 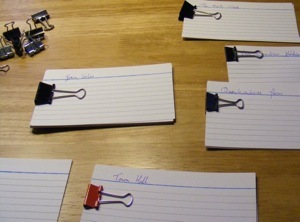 In LotFP, because I distributed spells, weapons and armour and other items as cards, players could also self-organise. In the late stages of the game this may have been counter-productive since play shifted from GM-centric (where GM has a strong narrative role) to table-centric, with the GM a facilitator at best. Because the players could claim different effects on cards without asking for verbal permission from the GM (since it was written down) they began to debate in-party on strategy rather than query the GM. In other words, they played the game like a collaborative board game. 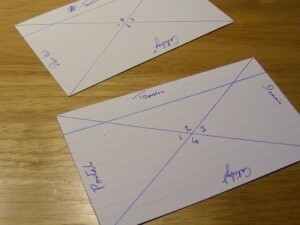 However unlike a board game there was no defined turn structure, so more vocal/forceful players could command attention for longer and dominate the direction of the party. I tried to keep the combats fair in terms of actions, but player-player resource negotiation and strategy discussion spilled over into other parts of the game and made for multiple conversations. Player-player strategy discussions happened during player-GM tactical/scene discussions, and confused things a bit. DRYH will see repeat plays; additionally it’s made me think about other d6-as-resource games. Mobile Frame Zero is another one. Hollowpoint could also be considered the same, since the pools remain on the table and may be later adjusted by burning Traits. By extension, Sorcerer has similar features. I am less sure about LotFP. It’s fiddly, the most fun parts–the magic system–emerge over campaigns and require familiarity with OSR tropes (Vancian casting, etc). A large part of the system is rewards and level gains, which aren’t really suitable for one-off games. Still, it could see repeat use. This is the year a lot of us turned 40! Now I have a couple of Districts, it’s time to turn them into the first chapter of my game. How much exposition you use is up to you–perhaps you’ll wait for the PCs to ask “what do I see?” Perhaps you’ll give a long diatribe on the history of the statue. That’s up to you. Whatever happens the different locations (with exception of the rooftops) are clearly indicated, there aren’t too many of them, and they’re all accessible to the PCs if they want to investigate. Of course if there’s a sudden change about to happen, that may divert attention away from the scene–which is another reason not to over-work the location. I didn’t mention the rooftops. Why? Well, they’re commonplace, but also I don’t want to draw attention to them right now. Of course if I had a particularly paranoid character who tended to look up for danger I’d let them–I might even allow them onto the roof if they can make a case for action. That could change the entire course of the plot–which is a good thing! It would be dishonest to the players if I deliberately omitted something that was unusual and obvious, but I think omitting details like rooves, doors, and maybe trapdoors (if they’re hidden) is fair game. Make the players ask at least a few questions, but don’t be dishonest. I digress. This isn’t meant to be a discourse on scene presentation. There are plenty of good RPGs that do that already. Back to the tools. Without spending too much time thinking about each location, I rank the axes from four down to one (with four being highest priority). Four means something that definitely will be seen or experienced by the players if they go there; one means nothing to see. I go for this one first. Immediately rank Catalyst 4 (there’s a clue here, if the players look). Portal is ranked 3 (the Rooftops connect to every other District in the city). Tension is 2 (if the PCs go here there’s a minor risk of peril from falling, etc). Domain is 1 (there’s no-one of consequence. This all ties in with my Assassin plot: the shooter appears on the roof, kills someone, and makes an exit. I haven’t decided who that is yet (but of course with the proximity to the Senate they’re bound to be important). I could have made Tension the highest ranked; this would be appropriate if the PCs were able to effect any change in the conflict. But since I chose low Tension, high Catalyst, they can’t–they’re not even aware of the shooter until the shot is made. I ranked this one Domain 4. There’s someone powerful here. Possibly the Snake represents foreign soil, or something powerful is sleeping within. Next comes Catalyst at 3. There’s a plot here, if the PCs want to explore it. Since it’s not ranked 4 the PCs won’t automatically uncover it, but they may get some interesting clues. Tension is 2 (there’s a minor threat, possibly if the PCs are spotted snooping by the wrong people) and Portal is 1 (it’s in the middle of the plaza, so doesn’t go anywhere). This one’s Domain 4 as well, because of the strong military presence. Tension is 3, on account of them being on alert for some reason; if the PCs get on the wrong side of them, they could be landed in jail or worse. Portal is 2 since the guns represent a transition between the City Centre and a military prison, although that’s unlikely to happen. There’s no clue here, so Catalyst is 1. The Portal is 4–jump on a Zeppelin and you could go anywhere! Tension is high at 3, and I decide it’s for the same reason that the military are on edge–although the civillian ground crews have not been given the same reason as the military for heightened security. Domain is 2 (there are air crews everywhere, but unlikely to stop the PCs if they nose around). Catalyst is 1. 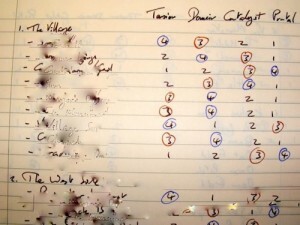 Portal is 4–this represents a transition from the outside into the secret political world. Something is going to happen that will transport the PCs from the world they know into one they don’t. The Domain is understandably high at 3 with all of those powerful people around. Tension is 2 (there are stirrings but probably only foreshadowing). Catalyst is 1. Domain is 4 here. The Collector represents Law and Justice. Tension is 3–someone is about to be executed. Catalyst is 2, and Portal is 1 (again, it’s in the middle of nowhere). Hilighting the 4 and 3 ranks gives some useful information. First, Domain is very strong in this area–displays of authority and law, more than one power group is directly involved with whatever plot happens. Second, Portal is strong. This area stands on the threshold of several other important locations. It’s possible that the PCs will be drawn back to this location again and again, simply because they are passing through. Third, Tension is not Mandatory. In other words, there’s definitely something going on but it doesn’t directly involve the PCs unless they stick their noses in. Catalyst is poorly represented, but that’s OK–if this is the start of the campaign then a couple of clear leads will be nice to get things rolling without swamping the party in information. That’s Nice, How Do I Use It? Someone or something is going to make their presence felt from the roof. The rooftops go somewhere, if they choose to go there. Or to put it another way, PCs take a reactive role against rankings of 4, and a proactive role (if they choose) for rankings of 3. Hopefully the locations and their rankings will make it easy to separate action from fluff. 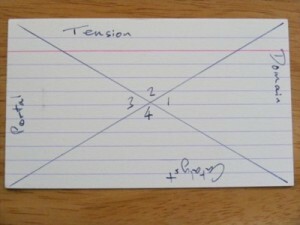 It should be clear than a Tension 1 or 2 will be merely some general disquiet or complaints which will quickly cave to PC pressure; however at Tension 3 if the PCs exert pressure on the location it will push back with real consequences, and at Tension 4 the location will exert pressure on the PCs as soon as they enter. These locations you’ve designed are now set. They are features that you can and should return to in later sessions. Hang on to the cards. If it helps, draw a rough map of how the districts connect and mark on your individual locations. Those numbers that you gave–they can change, up or down. Some of them can go higher than 4. When a party comes back to the Senate, suddenly its Domain has gone way down (as it opens its doors to the adventuring hoi polloi) and the Catalyst has gone up. But that’s for another discussion. p>This tool started off as a way for the GM to dump their brain and focus down on the important stuff. Like Mind Mapping, Mandala Charts and other techniques, this tool should be great at starting ideas. But I always found Mind Maps to be bad at sustaining creative activity; they’re great for an hour of intense thought but when coming back to them I’ve had a tendency to repeat the ideas I’ve already had, rather than springboard off existing ones. So, for this tool I want to close that gap. I want to be able to build and sustain the city as a place where stuff happens; at the same time I want to maximise visibility of the locations for the players. 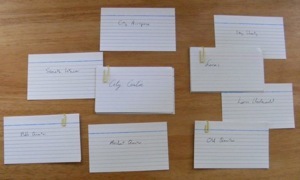 The next instalment will deal with sustaining the City creation.